Mike Tomlin addressed the contract status of his top running back and is hopeful that the key players being in the same room will bring about a long-awaited resolution to the Le’Veon Bell impasse. The 12th-year Steelers coach believes everyone involved in this process wants this deal finalized. Earlier Saturday, Ian Rapoport of NFL.com reported some late progress has emerged here after previously it was looking like a strong possibility existed of Bell hitting the 2019 free agent market. The deadline for franchise-tagged performers to sign extensions is 3pm CT Monday. If Bell does not reach a deal, he’s not expected to show up at the Steelers’ facility until after the preseason concludes. After losing Ryan Jensen to the Buccaneers, the Ravens are in need of a new center. Going into camp, the hope is second-year Raven and former UDFA Matt Skura commandeers the job, Edward Lee of the Baltimore Sun notes. A Duke product who entered the league two years ago, Skura started 12 games in relief of Marshal Yanda last season at right guard. Pro Football Focus didn’t view those starts as particularly memorable, placing Skura’s 2017 work near the bottom of the guard hierarchy. Lee adds that while Alex Lewis will be tried at left guard, the part-time 2016 Baltimore starter also hovers as a center option. A scenario where Tyrod Taylor sees another year in Cleveland by holding off Baker Mayfield into 2019 has been discussed by some this offseason. It just doesn’t seem realistic, Mary Kay Cabot of cleveland.com said (video link). Cabot does not see a scenario that Taylor is on the 2019 Browns, partially because he may have a starting opportunity elsewhere next season as Baker Mayfield ascends to claim the Browns’ job. Even if Taylor leads the Browns to a surprise playoff berth, Cabot can see John Dorsey following his former organization’s example by moving on from the starter that got them there and installing the first-round pick the following year. 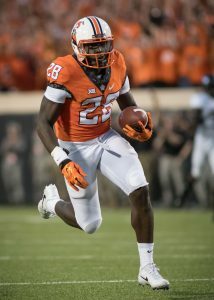 The Steelers drafted James Washington in the second round because they “love” his ability to adjust on deep targets and make contested catches, Tim Benz of the Pittsburgh Tribune-Review notes. Washington’s ability to win 50-50 balls will make him credible in an area in which Martavis Bryant didn’t display a reliable skill last season, Benz writes, though conceding the former Oklahoma State star doesn’t have Bryant’s athleticism. The Steelers have signed their second-round pick (No. 60 overall) wide receiver James Washington to a four-year deal, Pro Football Talk’s Charean Williams reports. During the draft, the team sent receiver Martavis Bryant to the Raiders, so the Steelers were looking to fill the void left by the big-play, but often troubled receiver. They found their guy in Washington. The team will hope its recent run of selecting wide receivers continues with the college star, who joins Antonio Brown and JuJu Smith-Schuster in a loaded aerial attack. At Oklahoma State, the electric receiver set a new school record and finished second in Big 12 history with 4,472 career receiving yards. He added 39 receiving touchdowns during his career and claimed the prestigious Biletnikoff Award as the nation’s top receiver as a senior in 2017. Washington said he is ready to step in and replace Bryant as the team’s go-to option on deep balls. “It all comes down to who wants it more, and nine times out of 10, I guarantee you I want it more,” Washington said. The quarterback he achieved those eye-popping numbers with won’t be far away, either, after Pittsburgh selected Mason Rudolph in the following round as the potential successor to longtime signal-caller Ben Roethlisberger. Brian Gutekunst remains confident the Packers will sign Aaron Rodgers to an extension this offseason, telling Mike Florio of Pro Football Talk he expects an agreement “soon.” The first-year GM said both sides continue to work on a pact. Although, the negotiations likely just saw the price rise since Matt Ryan‘s five-year, $150MM extension raised the ceiling for quarterback contracts. However, Gutekunst told Florio before Ryan’s Falcons agreement was finalized that both the Packers and Rodgers may be waiting to see if any other quarterback deals are completed this offseason. With Kirk Cousins signed and Ryan now locked up through 2023, Rodgers’ deal is likely next on the QB docket. Although, it’s still possible the Patriots and Tom Brady revise the reigning MVP’s contract. With two years remaining on Rodgers’ deal, Florio estimates the final result will be a contract closer to Ryan’s through-2023 deal than Cousins’ three-year accord. He also expects Rodgers’ new deal to further raise the quarterback ceiling, one that’s climbed considerably since Derek Carr became the league’s first $25MM-AAV player less than a year ago. Two rookies the Ravens may well have hoped to land went to AFC North rivals. Jeff Zreibec of the Baltimore Sun notes the Ravens were eyeing Miami running back Mark Walton with their fourth-round pick, but the Bengals ended up selecting him six spots before Baltimore’s next pick — one that went to Alabama cornerback Anthony Averett. The other player they may well have wanted ended up in Pittsburgh. Zreibec adds the Ravens most likely sought James Washington, who went to the Steelers late in the second round. Eric DeCosta said a few times during this draft he became “angrier than usual” because of a player going off the board just prior to a Ravens selection window, and Zreibec assumes the Oklahoma State wide receiver was the source of one of these agitation bouts. Brandon Coleman‘s Saints contract is worth a maximum of $1MM, Larry Holder of NOLA.com reports. Coleman re-signed with New Orleans after not being tendered as a restricted free agent. Had the Saints applied the low-end tender to Coleman, he would have made $1.9MM this season. After the Saints selected Tre’Quan Smith in the third round, Coleman and return specialist Tommylee Lewis could be battling for a roster spot, Nick Underhill of The Advocate writes. On the subject of Saints position battles, Underhill notes the Saints are high enough on Taysom Hill that they might be ready to cut Tom Savage and carry just two quarterbacks if Hill beats him out for the backup job. They also brought in J.T. Barrett this month. Hill served as the Saints’ third-string quarterback last season behind Drew Brees and Chase Daniel. It would cost the Saints just $100K if they released Savage. Gareon Conley has yet to receive full clearance to return to Raiders workouts, but Jon Gruden said that appears imminent, per Scott Bair of NBC Sports Bay Area. Conley underwent shin surgery last year after missing almost his entire rookie season. Gruden indicated the 2017 first-round pick is running with teammates and participating in walkthroughs but hasn’t been given a full green light yet. Both of Eric Berry‘s twin younger brothers are with teams this weekend. One will have a chance to join the All-Pro safety with the Chiefs. Elliott Berry is in Kansas City working as a tryout player, Adam Schefter of ESPN.com tweets. Meanwhile, Evan Berry signed with the Browns as a UDFA on Friday. Both of twins played at Tennessee, as Eric did.